Tectonic setting of New Zealand adapted from Barth (2012), showing the west-dipping Hikurangi Subduction Zone, the approximate outline of Taupo Rift / Volcanic Zone, the dextral Marlborough Fault System and Alpine Fault, and the east-dipping Puysegur Subduction Zone. New Zealand, Aotearoa, has long been a place I’ve wanted to visit. It owes its incredible and diverse landscapes to a fascinating combination of tectonic and volcanic processes, and there is plenty to keep a geologist excited. Built on the mostly-submerged ancient continental crust of Zealandia, the present-day New Zealand rises above the ocean thanks to the collision between the Pacific and Australian tectonic plates. On the north island, the Pacific Plate dips westward beneath the Australian plate at the Hikurangi subduction zone off the east coast. 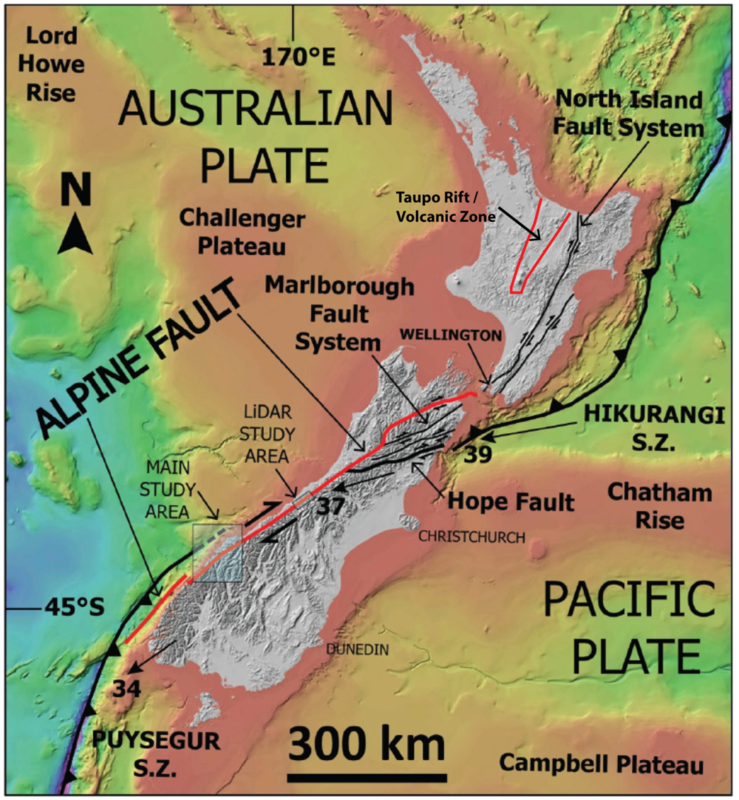 At the southernmost end of the South Island, the polarity of the collision is reversed, and the Australian plate dips eastward beneath the Pacific Plate at the Puysegur Subduction Zone. It is the transition between eastward- and westward-dipping subduction that gives New Zealand some of its most unique geological features and geothermal resources. During my visit, I had the opportunity to explore nearly the entire length of the onshore plate boundary, from subduction zone to subduction zone, stopping along the way at the Taupo Volcanic Zone, Marlborough Fault System, and Alpine Fault. My visit was hosted by GNS Science, a government-owned research institute responsible for a wide range of geoscience research in New Zealand. In this blog I will share some of what I learned from these fantastic scientists. As with many other subduction zones around the world, there is a chain of volcanoes on the North Island that runs parallel to the trench. At a certain depth, water is released from hydrous minerals the subducting plate, inducing partial melting of the mantle, which ultimately leads to volcanism. This particular volcanic chain is known as the Taupo Volcanic Zone, and includes famous volcanoes and calderas like Ruapehu, Ngauruhoe (Mt. Doom from LOTR), Tongariro, Taupo, and Okataina. 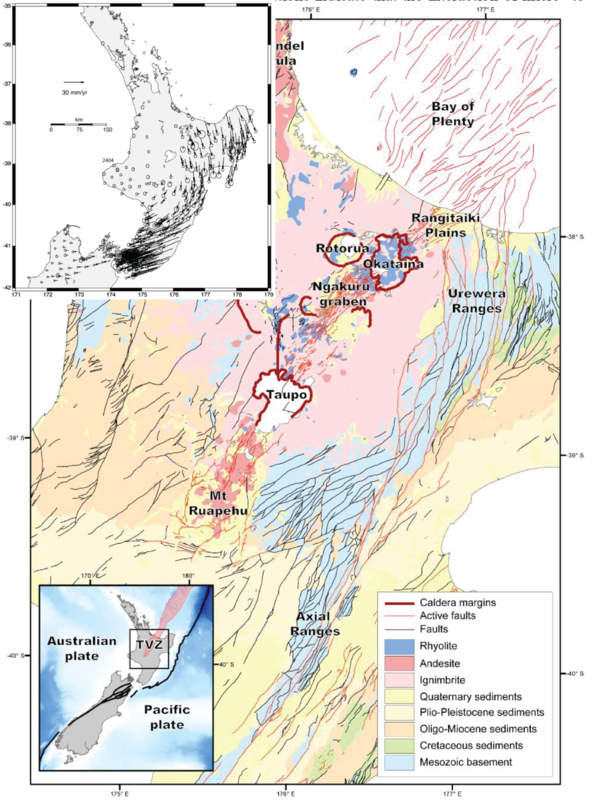 Geologic map of the North Island, including the volcanoes and calderas of the Taupo Volcanic Zone, and extensional faults of the overlapping Taupo Rift (Villamor et al., 2017). Upper left inset shows crustal velocities of the Pacific Plate relative to the Australian plate (Wallace et al., 2004). Note the clockwise rotation of the forearc, resulting in extension at the Taupo Rift, and transpression towards the south. Where the Hikurangi Subduction Zone merges with the Marlborough Fault System near Cook Strait, the subduction interface is locked (not slipping). To the north however, it becomes unlocked, and the subducting slab is rolling back (eastward) into the mantle. Because of this along-strike change in locking, the entire forearc region (area between the inland volcanic chain and the oceanic trench) is rotating clockwise around an axis in Cook Strait. The consequence of this rotation is crustal extension in the Australian Plate in an area known as the Taupo Rift, which begins near Mt. Ruapehu and widens towards the north to the Bay of Plenty. Offshore, rifting continues in the Kermadec-Tonga Trough. The Taupo Rift overlaps almost completely with the Taupo Volcanic Zone, making the Taupo Volcanic Zones a rare example of a rifted volcanic arc. The combination of active volcanism (Taupo Volcanic Zone) and active crustal extension (Taupo Rift) creates the perfect setting for high enthalpy geothermal resources, as there is an abundance of heat in the shallow crust, and plenty of fracture permeability to allow the circulation of geothermal fluids. There are 23 high temperature geothermal fields in New Zealand, mostly centered around the touristy towns of Taupo and Rotorua. Some of these fields are preserved for their natural appeal, while others are host to power plants. Currently, geothermal energy contributes about 17% of the national electricity production, with a capacity of just over 1000 MW. The majority (59%) of New Zealand’s power comes from hydro dams, but 16% still comes from fossil fuels (coal, diesel, and natural gas). New Zealand’s government has committed to have net zero emissions by 2050, and, geothermal energy may be part of the solution – but, doubling geothermal power output is no easy task, especially when many of the known fields are already developed. The champagne pool at Wai-O-Tapu geothermal area near Rotorua. This is one of the 23 high-temperature geothermal areas on the North Island, but it is not used to generate electricity. Magnetotelluric resistivity model of the Taupo Volcanic Zone, showing the deep roots of the hydrothermal system (Heise et al., 2016). Models like this are useful for locating potential supercritical geothermal resources, as well as understanding the long term evolution of the earth’s plumbing system. With most of the obvious geothermal fields already developed, researchers are looking towards more unconventional sources. There is considerable interest among scientists to explore the possibility of supercritical geothermal resources, much like those being explored in Iceland. Supercritical fluid (beyond the critical point of ~377°C and 217 atmospheres) contains about 10x more thermal energy than conventional fluids and would therefore be a massive power source if tapped into. The trick with exploring for supercritical fluids is to find a zone where the crust is still brittle, not molten. Iceland’s first attempt at this ran into problems when they struck an unexpected zone of molten magma. Furthermore, for fluids to circulate, brittle fractures must exist, and these do not exist below the brittle-ductile transition. 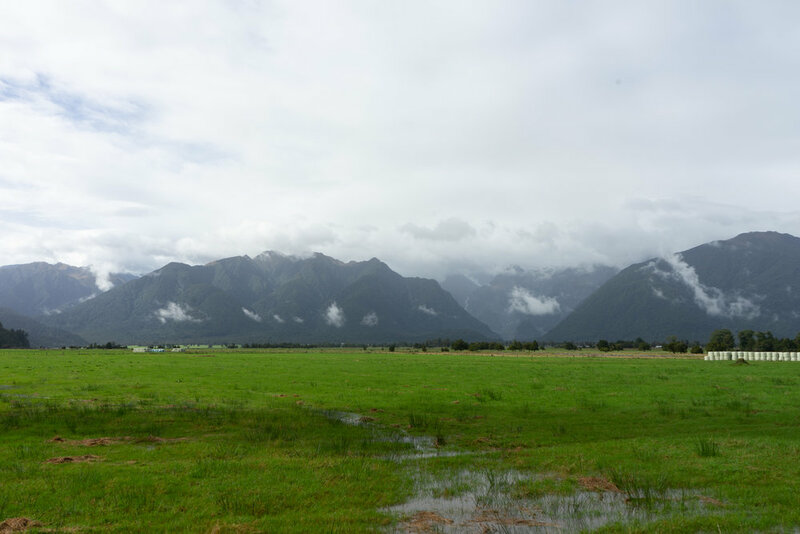 An interesting direction of geothermal research in New Zealand seeks to determine what the natural life span of geothermal resources is. Geothermal resources are typically considered renewable, and if managed properly they can certainly produce energy for long periods of time. However, particularly in such a volcanically and tectonically active region as the Taupo Volcanic Zone/Taupo Rift, natural events such as earthquakes and volcanic eruptions can drastically change the “plumbing” of earth’s crust. It is therefore important to understand the triggering mechanisms and recurrence intervals of these events not only from a public safety point of view, but also from an economic one – i.e., would such an event mean the end of a geothermal system. Indeed, there is evidence for extinct geothermal systems in the form of fossil sinter (siliceous precipitate from old hot springs) hinting at the ephemeral nature of the geothermal upwellings. My initial plan in New Zealand was to participate in the excavation of a paleoseismic trench in north end of the Taupo Rift, in search of evidence for the inter-relation between volcanism, tectonics, and hydrothermal systems. Sadly the trenching had to be postponed due to unforeseen issues with land use permissions, but I still learned a lot while in the area. Paleoseismic trenches are commonly used to establish the rupture history of young faults based on observed offsets in young, typically unconsolidated sedimentary layers. An excavator is used to dig a trench, several meters deep, and 10s of meters long across the surface trace of a known fault. The walls of the trench are mapped in detail and then graphics software is used to virtually restore each successive offset. 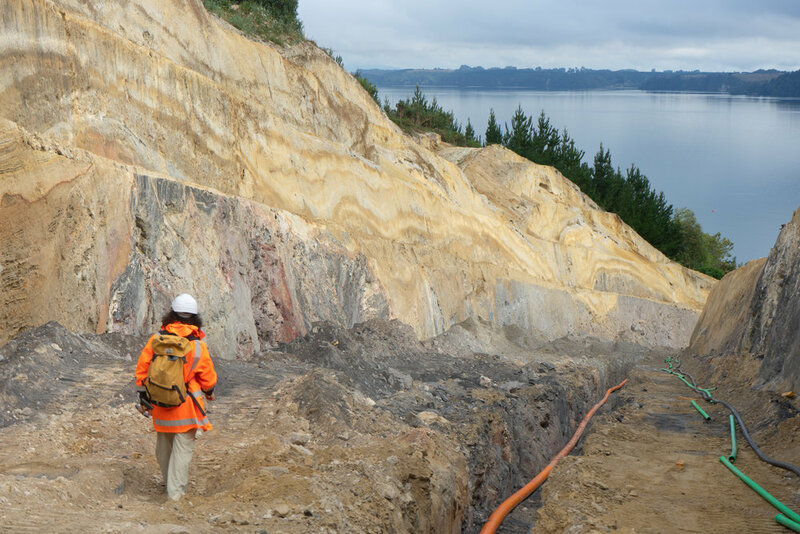 In the Taupo Volcanic Zone, trenches can provide exceptionally detailed earthquake rupture histories thanks to a distinct and easily-dated succession of volcaniclastic deposits from past volcanic eruptions. Some trenches also include fossil sinter layers, indicating past geothermal fluid upflow. Thus, by reconstructing the relative timing of volcanic eruptions, faulting, and fluid flow, one can start to piece together a very detailed history, possibly showing whether tectonism triggered volcanism or vice versa, and if tectonism or volcanism triggered, blocked, or diverted hydrothermal fluid flow. An excellent cross-section of volcaniclastic strata exposed in a water pipeline corridor near Rotorua. Unfortunately there were no faults to investigate here - if there were, this would have made for a fantastic paleoseismic trench. Of course, there are more complications to understanding the location of geothermal systems, number one being that topography also plays a large role in the location of upwellings – and this is something that is difficult to decipher in a paleoseismic trench. 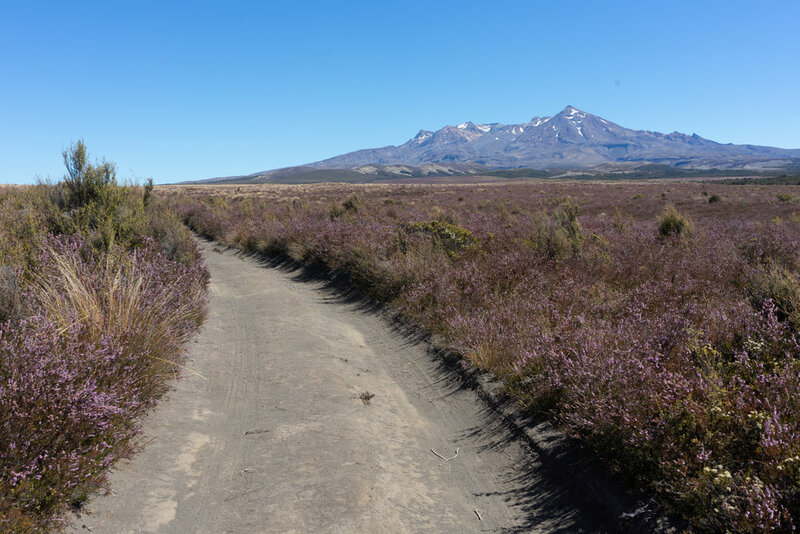 It has been shown in the Taupo Volcanic Zone, despite extremely high heat flow and subdued topographic relief, that geothermal upwellings are mostly found in topographic lows. This means that landscape evolution and erosion (which of course, are intimately tied to climate and tectonics), may play a role in the long term evolution of subsurface hydrothermal systems. 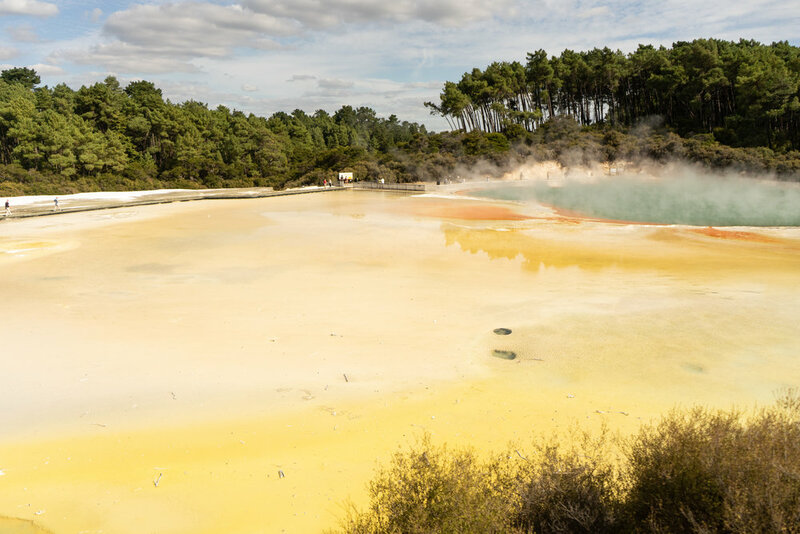 For many decades there has been interest in the possibility of developing lower-enthalpy geothermal resources on the South Island, which does not possess a high-enthalpy resource like the Taupo Volcanic Zone. Much like in western Canada, the Southern Alps have a number of thermal springs that are suggestive of a possible geothermal resource. These thermal springs are closely spatially associated with the hanging wall (eastern side) of the Alpine Fault. 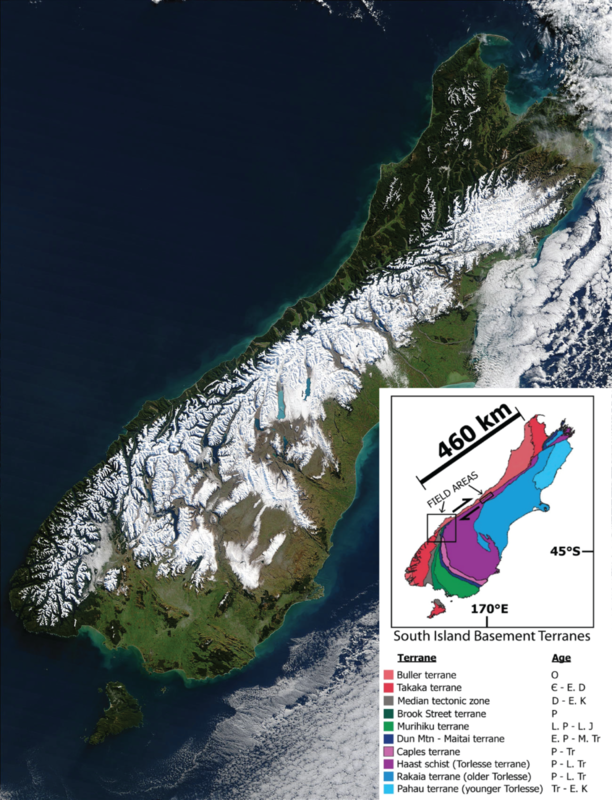 The snowline after a major 2003 blizzard clearly delineates the Alpine Fault along the west coast thanks to rapid tectonic uplift on the eastern side of the fault (Source: NASA Earth Observatory). Inset shows the major basement rock terranes of NZ (Barth, 2012). The Dun Mountain - Maitai terrane (dark blue) is a key piercing point, offset by ~460km. Motion on the Alpine Fault is ~75% right-lateral and ~25% reverse (thrust), and over its ~25 million year life-span, the eastern side has shifted almost 460 km southward relative to the western side. This immense amount of displacement was first recognized thanks to a distinct belt of ultramafic rocks known as the Dun Mountain ophiolite, which were cut in two by the fault, and now outcrop on the west side of the fault near the town of Nelson, and on the east side way down south near Mt. Aspiring. The average strike-slip rate of the Alpine Fault is estimated to be ~20-30 mm/year, although it is currently locked and much of this strain will likely be released as a large earthquake in the future. The 25% of reverse slip on the Alpine Fault is responsible for the growth of the Southern Alps, which reach elevations as high as 3724 m at Mt. Cook. As the Pacific Plate is thrust skyward, erosion is outpaced by uplift, allowing the mountains to grow. Uplift is so rapid infact, that cooling isn’t keeping pace with exhumation. This was confirmed recently as part of the Deep Fault Drilling Project (DFDP) conducted near the town of Whataroa. The primary aim of the DFDP was to observed the physical properties of the Alpine Fault and install an in-situ observatory to improve earthquake hazard monitoring. To everyone’s surprise, they found extremely hot temperatures at shallow depths, with an astounding geothermal gradient of 130C/km! This discovery has re-stoked hopes that geothermal resources could be developed on the South Island. 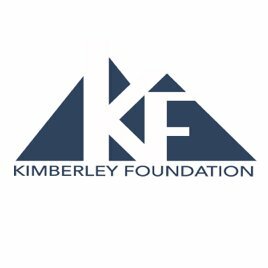 Researchers have undertaken preliminary studies to learn more about the potential resources in this region. In doing so they have also found possible geothermal resources in the footwall (western side) of the Alpine Fault, which while not uplifting at the same rate, is undergoing active deformation. A set of anticlines and synclines in the vicinity of Greymouth are actively bending, and as a result, the geothermal gradient in the anticline cores are elevated. Targetted drilling on the peaks of these anticlinal structures may yield low-enthalpy geothermal resources suitable for direct use heating. Ironically, this sort of exploration strategy is very similar to old-school oil exploration, where the peaks of anticlines were targeted as structural traps of buoyant hydrocarbons. Historically, the economy of Greymouth and surrounding towns on the west coast have been based on coal mining. Coal is still produced here and many homes and industrial facilities still use coal for heating. Naturally there is excitement among locals to develop direct use geothermal systems to replace coal heating. Thermal and cold mineral springs, and wells with elevated thermal gradients in New Zealand (Reyes et al., 2010). Note the concentration of springs along the Alpine Fault, and the wells with elevated geothermal gradients near Greymouth. The thermal springs in the Southern Alps share many similarities with the thermal springs in the Canadian Cordillera including similar outlet temperatures, maximum temperature estimates (from aqueous geothermometry), topographic relief, and climate. 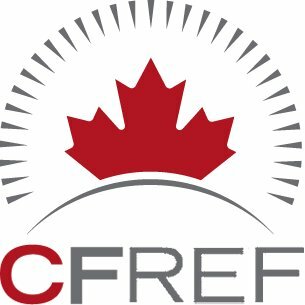 It is therefore tempting to wonder if similar resources exist in Canada. The main difference is the lack of major active uplift on a major fault structure like the Alpine Fault. The Canadian Cordillera is home to many large fault systems, however none are the main plate boundary fault, and none have been shown to have such active uplift rates. That said, GPS data is sparse in the Canadian Cordillera, as is thermochronological and borehole data. At this point I would say that it is too early to tell if a similar tectonically-induced geothermal anomaly might exist in Canada. The discovery of a geothermal anomaly on the Alpine Fault could represent a whole new kind of geothermal resource, as of yet undeveloped worldwide. It certainly begs the question of whether other highly active transpressional fault systems have similar geothermal gradients. The Alaska Range, home to the rapidly rising Denali (formerly Mt. McKinley) comes to mind. I also wonder what the thermal regime might be in active compressional mountain belts like the Andes and Himalaya, though I suspect that the geometry of these systems may not be as conducive to high geothermal gradients as more vertical strike slip systems. These would make for some exciting research projects! Looking east at New Zealand’s Southern Alps near Fox Glacier. The Alpine Fault runs along the base of the mountains, which rise up to 3724 m at Mount Cook, here obscured by cloud. Rapid active uplift of these mountains has led to an elevated geothermal gradient on the eastern side. Denali, an enormous mountain (6190m) driven skyward by active dextral transpression on the Denali Fault. I wonder if the Denali Fault might create a similar elevated geothermal gradient as the Alpine Fault. Barth, N.C., 2012, A Tectono-Geomorphic Study of the Alpine Fault, New Zealand: 303 p.
Heise, W., Caldwell, T.G., Bertrand, E.A., Hill, G.J., Bennie, S.L., and Palmer, N.G., 2015, Imaging the deep source of the Rotorua and Waimangu geothermal fields, Taupo Volcanic Zone, New Zealand: Journal of Volcanology and Geothermal Research, v. 314, p. 39–48. Pearson-Grant, S., Milicich, S.D., White, P.A., and Kissling, W., 2017, Numerical modelling of the influence of geology and groundwater recharge on geothermal systems in the central TVZ: Proceedings 39th New Zealand Geothermal Workshop. Reyes, A.G., Christenson, B.W., and Faure, K., 2010, Sources of solutes and heat in low-enthalpy mineral waters and their relation to tectonic setting, New Zealand: Journal of Volcanology and Geothermal Research, v. 192, p. 117–141. Sutherland, R., Townend, J., Toy, V., Upton, P., Coussens, J., Allen, M., Baratin, L.-M., Barth, N.C., Becroft, L., Boese, C., Boles, A., Boulton, C., Broderick, N., Janku-Capova, L., et al., 2017, Extreme hydrothermal conditions at an active plate-bounding fault: Nature, v. 546, p. 137–140. Villamor, P., Nicol, A., Seebeck, H., Rowland, J., Townsend, D., Massiot, C., McNamara, D.D., Milicich, S.D., Ries, W., and Alcaraz, S., 2017, Tectonic structure and permeability in the Taupô Rift: new insights from analysis of LiDAR derived DEMs: Proceedings 39th New Zealand Geothermal Workshop, v. 22. Wallace, L.M., Beavan, J., and Mccaffrey, R., 2004, Subduction zone coupling and tectonic block rotations in the North Island, New Zealand: Journal of Geophysical Research, v. 109.